A Monday Girl x Y.E.S! Event in support of Dress For Success event celebrating the most influential women in Toronto. Ladies of Toronto! Mark your calendars for a fabulous and jam-packed event featuring the city’s most influential women from a diverse range of industries. Join us for an immersive experience with h’ors d’oeuvres, amazing gift bags, a fun House of VR Pop-Up, and inspiring panels. VIP Goody Bag – Peace Collective, Equinox and more! 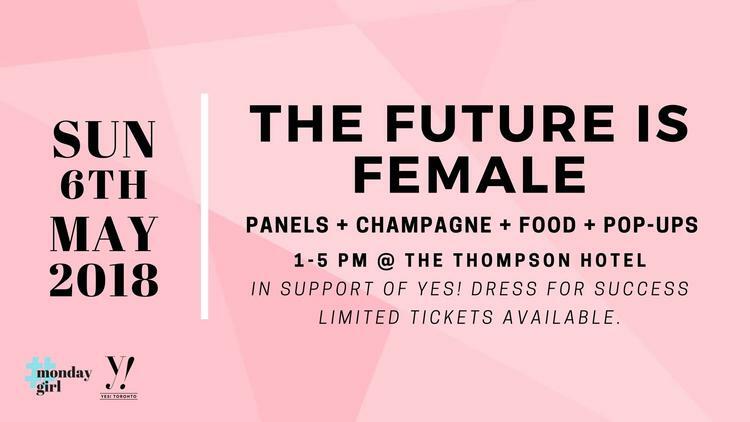 The Future is Female is brought to you by Y.E.S! and Monday Girl and will be in support of Dress for Success Toronto. Be sure to visit the on-site DFS booth to learn more about how Dress for Success Toronto has helped over 10,000 women in the GTA transition out of unemployment since 2009.